When you need explosive starting ability, and dependable lasting power, Centennial Commercial batteries rise to the challenge, built tough to meet or exceed your most demanding requirements. From commercial trucks to heavy duty equipment, we offer a complete line of heavy duty batteries to fit your application and get the job done. Deep Cycle batteries are constructed to maintain a continuous flow of energy. Some applications which require deep cycle batteries are trolling motors, house lights, stereo systems and motor home accessories. They are designed to endure the frequent, complete discharge and recharge essential these applications. This is called "Deep Cycling". Upon purchase of this Centennial Automotive battery(ies), a core(s) charge of $18 per battery will be charged in addition to the cost of the battery(ies). If a core(s) is returned (battery for battery) at time of pick-up, then the shipping fee and core fee(s) will be waived after completion of the pick-up. Please contact us Toll Free (800) 515-BIAF to learn more. NOTE: This battery is for local pickup only. This battery type can NOT be shipped FedEx or UPS, Only common carrier freight or local pick-up. Please contact us Toll Free (800) 515-BIAF to learn more. Only the GREEN STATES in the map below indicate which states will use local pickup. 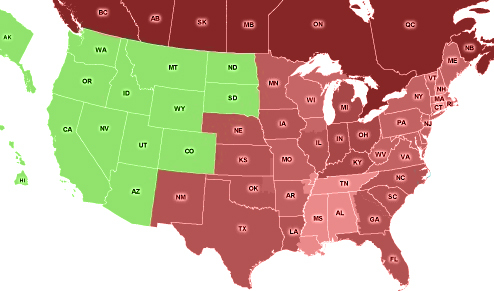 States in RED are only available for common carrier freight charges. Please contact us Toll Free (800) 515-BIAF for the closest location near you for pick-up, or for common carrier truck freight charges. Batteries In A Flash supports a clean & green environment. Need more Centennial Batteries CEN-C-17TF? We offer great discounts on quantity orders and FREE SHIPPING offers are available. No specification or documents available currently available for CEN-C-17TF. If you require a spec sheet, a msds sheet or any additional documents, please contact us and to request them. We will work to accommodate you.